Wealth flowed during the 1880s and 90s, but only to the upper echelons of society. A vast gulf opened between rich and poor, earning this era the nickname "the Gilded Age." One immigrant photographer captured what it was like for New York's poor during this time, and his images remain arresting today. The Danish-born carpenter Jacob Riis (1849-1914) migrated to the US in 1870. He started his career as a journalist in 1873 as a police reporter, only three years after he arrived in New York. Later he became the city editor of the New York Tribune. 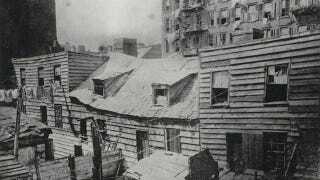 When flash photography was born in 1887, he and three photographer friends began to photograph the slums of New York City and three years later he published How the Other Half Lives: Studies Among the Tenements of New York with more than a hundred photographs. Later he wrote some other books, but none of those could approach the success of How the Other Half Lives. The whole book with photos and illustrations is available here. Lodgers in a crowded flat on Bayard Street. It cost five cents a day. A Black-and-Tan Dive in "Africa"
The photos are from Zeno, except when noted otherwise.